Porsche Cayenne demonstrates surprising dexterity around corners. The current car isn't quite as adept off-road as the original Cayenne, but we can't imagine many people will care. Be it new or used, the Cayenne is one of the best luxury SUVs you can get. 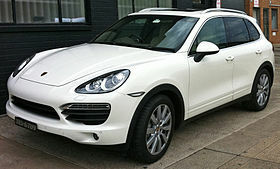 The Porsche Cayenne is a five-seat midsize luxury SUV with a number of different trims that correspond to its engine. The base Cayenne features a 3.6-liter V6 that produces 300 horsepower. All-wheel drive and a six-speed manual transmission are standard. An eight-speed automatic is optional with the V6 and standard on everything else. Stepping up to the Cayenne S gets you a 4.8-liter V8 that gets the party really started with 400 horses. Porsche apparently likes working in 100-hp increments since the Cayenne Turbo produces 500 hp and consequently delivers incredible performance (the Power Kit ups it to 540 hp). Should you care less about performance and more about fuel economy, the Cayenne S Hybrid produces 380 hp, but returns better fuel economy than the base, gas-only V6.